Models that register at WMA will be listed in one of the the biggest modeling databases on the Web. Professional and semi-professional models get access to registered modelling agencies, scouts and photographers. 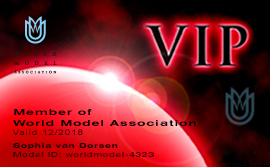 Registered models also gain access to calls for offers by agencies, and they can post their profile in the WMA worldwide database. The members of WMA are professional and semi professional models of all nationalities. The minimum age for membership is 14 years (in case of minority, the agreement of their parents required). To become a member, the application form has to be filled out. The monthly member fee is 5 Euros only! Models can cancel their membership any time! *NEW: For each new paying model member that is recruited by a registered member of WMA, the member gets back 12,- euro in cash! Its easy. Just send the affiliate code that you receive after registration to your friends. Your annual membership fee is fully paid, with just 10 new models that register with your affiliate code. All payments are done by PayPal or WorldPay (secure credit card payment). As an registered model you will be given your own e-mail address (e.g. catarina@worldmodel.org) at no charge! Please observe! Some services may be different or may still not be available in several countries!